Dive Journal: Following our week on the Cuan Law, we settle in to an idyllic rental house on Tortola, located on the western shore of Cane Garden Bay. We spend the next week tooling around the island in our rental car. 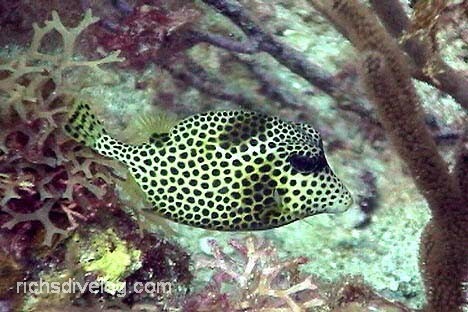 For fun one afternoon, Linda and I decide to hitch up with one of the dive shops local to Cane Garden Bay. We meet an extremely friendly instructor named John Day and make plans to go out the next morning. We meet John in a sorta beat-up old fishing trawler the next morning, aptly named the Molly Brown. John takes us over to Jost Van Dyke, about 3 miles northwest of the Tortola coast. We head for the eastern outcroppings and set anchor off Little Jost Van Dyke Island. Linda and I are the only ones diving with John today, and it immediately feels like a special private diving charter for us. We’re also the only ones at the dive site – love it! Our first site, Twin Towers, is very beautiful topside. Underwater, the beauty continues with near vertical walls of rocks descending steeply and lush soft corals everywhere. There are also some large dense areas of fire coral to avoid here. 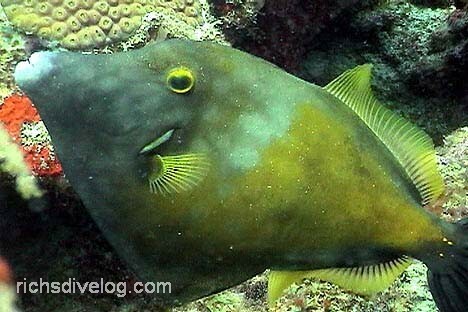 We find a nice big nurse shark, then some flowing schools of brown chromis, a gaudy white spotted filefish, and a scrwaled filefish. John leads us through many stunning passages through gargantuan boulders, rock walls, and ragged canyons. Nice dive. Driving: An adventure in itself since cars drive on the lefthand side and most drivers seem to be in mad rush to get somewhere. Couple this with lots of blind turns, streets only wide enough for a car-and-a-half, and extreme grades. The biggest driving challenge of all was trying to enter busy traffic circles in downtown Road Town, with everyone going the wrong way. Evenings on Cane Garden Bay: We spent several evenings simply perched on our deck overlooking the water, reading. Our view took in the beachside bars across the water, and often the live music would also reach us. Local favorite Quito Rhymer owned one of the bars and played acoustic sets while we were there. Trellis Bay Cyber Cafe: July 31 was a full moon night, and Dennis (from the Cuan LaW) has told us about the full moon parties on Tortola. There is a rustic shack of a bar out on the west end called the Bomba Surfside Shack, and on full moon nights they hold anything-goes parties, complete with plenty of Bomba punch and a mushroom tea. Despite our unfamiliarity with the island, we took off in our rental car and finally found the place. Cars were lined up and slowly inching through the area of the party, and there were bodies lying everywhere on both sides of the street. Linda and I decided that this party probably wasn’t quite right for the kids, and we instead opted for our backup plan, to the far eastern edge of Beef Island to a tamer version of the full moon party. It took us a while to find the Trellis Bay Cyber Cafe, but we found the party in full swing once we did. The seasoned chicken dinner was excellent and the music and dancing were infectious. Around 10pm, some boys waded out into the water and set several fires ablaze. There were large metal grills in the shape of ornate spheres perched just inches above the water level, and they were filled with wood. Once the fires got going, they cast a gorgeous dancing glow onto the surface of the water – a hypnotic sight. Night snorkelling in Cane Garden Bay: John and I went night snorkelling one evening, and we took the video rig for fun. We saw lots of excellent sights, including octopuses, feeding squid, eels, lobsters, and crabs. One of the more exciting sights was a sea wasp, which only unnerved Johnny later after we looked at it again on the video. Smuggler’s Cove: We took a day trip drive to Soper’s Hole to the far west end of Tortola, and we found a steep road taking us down to Smuggler’s Cove. This is a truly idyllic spot, isolated, fabulously turquoise, with excellent swimming and snorkelling. The kids spent hours in the water. We finally found a rustic little bar and enjoyed tropical beverages on the beach – doesn’t get much better. Emanicipation Festivities: The family spent a sweltering day on the packed streets of Road Town enjoying a parade that commemorated the reading of Tortola’s Emancipation proclamation on August 1st, 1834. The parade was full of brilliant costumes and way-cool music and dance. Little Lambert Bay: We also discovered this local spot, a tranquil bay on the island’s north side. Excellent for swimming and relaxing – we spent most of an afternoon there.